Photo of the then Duchess of York (future Queen Mother) on a fishing trip in Australia after opening Parliament House in Canberra, 1927, via The LIFE archives. 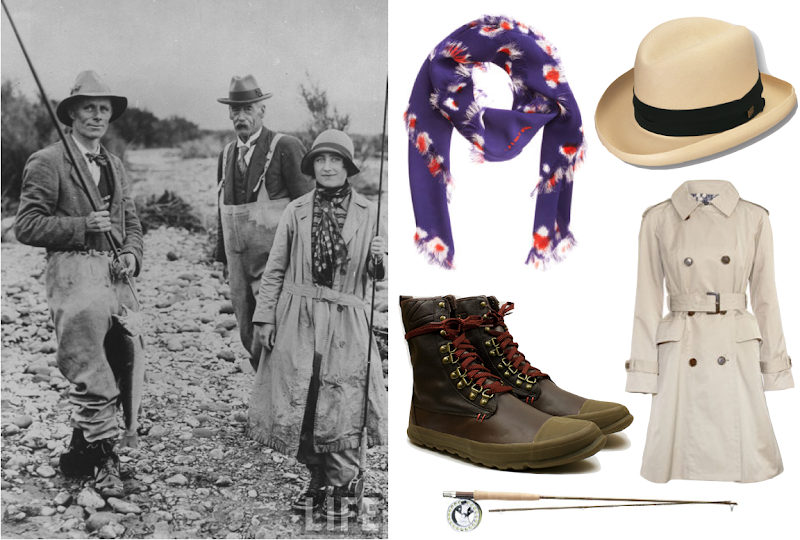 Silk David Szeto scarf ($370); Dobbs "Eldorado" straw hat ($75); Marc by Marc Jacobs trench ($458); Tretorn Klipporone boots (men's) ($154); Sage fly rod and reel (prices vary). do they make those boots in extra small size? they are awesome. They are so awesome! I'm still looking for a place where they have sizes beyond Men's 9.5 and 10. I think we might have to wait 'til next season unfortunately. I'll keep looking. I just loved this photo! How stylish this wonderful lady was! I just loved this photo! How stylish this wonderful lady was!